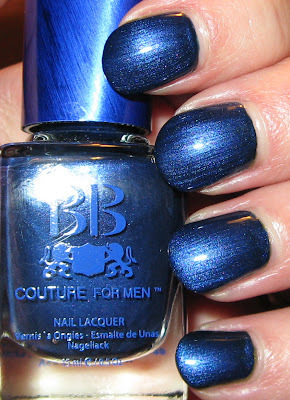 Above: BB Couture Grenade may not be everyone's cup of tea, but I love it! These all covered nicely in 2 coats and the photos were taken indoors with a flash. Grenade is an Olive green shimmer with very fine gold and multi-colored shimmer or glitter. Above: Night Ops is more of a shimmer with glitter. It's a deep cobalt blue with a hint of teal, and the glitter is an aqua jeweled tone. Below: Military Blues is one of those special polishes that seem to glow from within. It's a deep royal blue shimmer that reflects the light in such a way that the color appears to fade from a lighter to a darker shade. Whew, I got my Rescue Beauty Lounge order in! I'm trying to play catch up on my blog today because I'm massively behind on swatching and comments. I keep a small stash of polishes on my desk that I never got around to posting about, usually leftover ones from collections I've started to share with you but never finished, so I'm trying to clean those up. 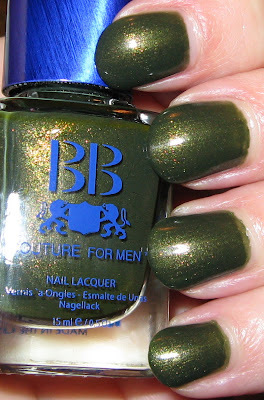 Today I have the last of the men's polishes from BB Couture/Overall Beauty that I was posting last week, and I still have 2 China Glaze Glitters and 2 of Old Navy's Tip Toe polishes sitting here, which I'll try and swatch later today. I received swatches from Yen at Victoria Nail Supply of the new Color Club Japanese Exclusive Glitters they'll be stocking soon, so I'd like to get those posted up as well. I don't know why these need to be "mens". They're all great! I like Night Ops, I love dark sparkly/shimmers. I have that first collection. I haven't even worn any of them yet. I ordered the second men's collection and the disco collection from OverallBeauty. I got my Rescue Beauty order in also. Those gorgeous polishes look fantastic on you. I especially love the green of course. Those look really cool, although I am not sure why they are "men's" polishes. Night Ops is so hot! I have to get at least that one! I love them both! Grenade is next on my list. Mary, I hear you about stray bottles from past collections. I think I am going to have a 'housekeeping week' in January to give those shades some nail time! Danica~I know, they're perfect for us ladies! gildedangel~I guess just to attract another market, but we like them too! Evil Angel~BB Couture always has such unique shades. You need to check them out! Ange-Marie~glad you like them! I think my RBL order will be here Monday...so excited! Pinkginger~glad you like Grenade also. I just love it! Diana~I just need to take a week and do nothing bit swatch to get caught up! But you know that can't happen, unfortunately! Grenade is a stunner, I agree, although I'm sure not everyone feels that way. What's wrong with them?! !